Sign up for our email list to join our community and receive your FREE Welcome Pack to get started today! Get Strong and Slim At Any Stage: Whether you are post baby or post menopause, we’ve got options for all of the seasons of your life! Stop wasting your money on fads, gimmicks and extreme plans that don’t work or are too hard to stick with! We make it simple to get in shape at home safely and effectively. For less than the price of a single session with a personal trainer you’ll get our custom, 6-week plan that’s designed to progress with you. I’ve been a certified personal trainer, wellness coach and group exercise instructor for over 15 years, and the number one question I get asked is, what’s the best workout to lose weight? It’s not about weight loss. It’s about TRANSFORMATION. See, before I was a fitness professional, I was 40 pounds overweight and frustrated. I had tried countless diets and extreme exercise plans and I failed at every single one. I’d lose a few pounds and then gain them all back (plus a few more). Finally, one day I stopped punishing my body and started listening to it instead. I stopped starting over and started transforming the way I moved, ate and lived. Since then, I’ve helped countless clients and students do the same. Now, I want to help you do it too. This plan isn’t about going on yet another diet. Or trying to adhere to some crazy intense workout program that promises you six pack abs in 10 days and makes you feel horrible in the process. I created this 6 week program to help you enjoy exercise and create lasting lifestyle changes that give you energy, vitality and to finally let go of the excess weight that’s holding you back. It’s the exact blend of exercise that I’d recommend for you if you were my personal client. If you are tired of struggling, feeling frustrated with your body and are ready to let go of those unwanted pounds for good this time, this is the plan for you. Get it instantly via digital download! effective exercise isn’t a punishment, it’s a treat! Forget the idea of “NO PAIN NO GAIN.” If your workout is painful, it’s not right for you. That’s why our program has just the right blend of intensity, varied workout styles, challenge and repetition to help build you up, not break you down. 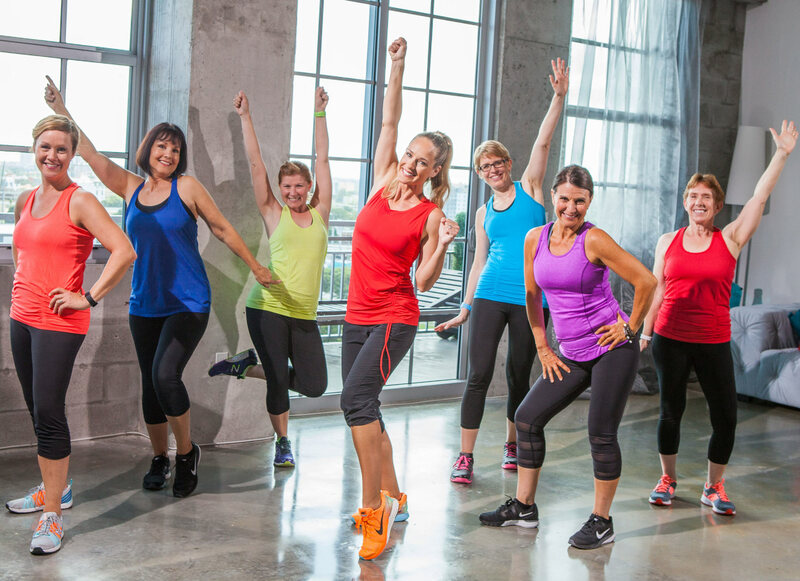 #1: CARDIO PARTY gets you moving and grooving on those days you don’t feel like exercising. #2: INTERVAL MIX for a tough, but doable, high intensity cardio. #3: 360 ABS a cardio combo of waistline cinching moves. #4: BRAIN FITNESS FUN designed in concert with Dr. Marie Pasinski, a neurologist and faculty member at Harvard Medical School, this is mind and body fitness at it’s best. #5: BAREFOOT FUSION SCULPT for balance, endurance, and flexibility all the way down to your ankles and feet. #6: TOTAL BODY TRAINING for an all over muscle building, metabolism boosting workout. #7: UPPER BODY STRENGTH for stronger, more sculpted arms, chest, back and abs. #8: LOWER BODY SCULPT for more lifted, shapely and defined buns, thighs and back. #9: DYNAMIC STRETCH to stretch and restore. #10: PREHAB ROUTINE to prevent injury, reduce aches and pains and improve your range of motion. BONUS #1: The Total Transformation “6-Week Wall Calendar” shows you exactly what workout to do each day. Check them off as you go to stay inspired and on track. 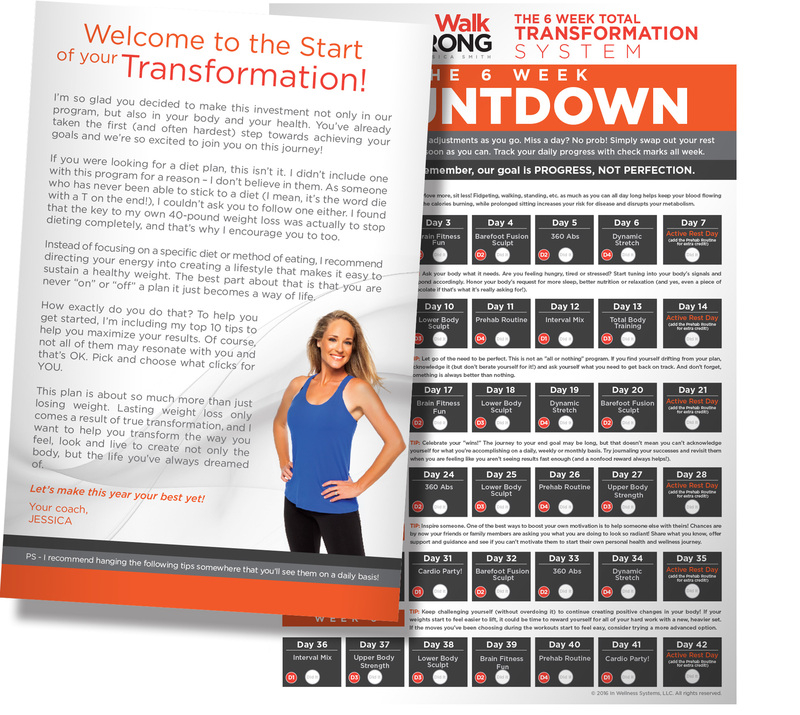 BONUS #2: Our Total Transformation “Welcome Guide” featuring our top 10 tips to help you create lasting results. BONUS #3: Free online support from our expert team (including Jessica) plus our incredible, global online community! and, get free shipping when you order now! Safe, effective exercises for all levels. Whether you are just getting started or have been working out for years, we’ve got something for everyone with this plan. Low impact options throughout plus additional modifications for some potential knee and hip issues. A balanced mix of workout styles and intensities to help you find the right amount of exercise for appetite control and energy. Maximum use of your daily workout time. Each routine is 30 minutes from start to finish, so you can fit it into your busy schedule whenever it’s most convenient for you. No guesswork! Simply follow our customized 6 week schedule and have fun getting fit at home – no gym membership required. what exercise equipment will you need? Hand Weights. We recommend using one set of lighter weights (2-10 lbs, depending on level) and one set of heavy weights (5 – 25 lbs, depending on level). Only have 1 set at home? No problem. Start with what you have and upgrade when you are ready for more. Brand new to exercise? Try subbing in two 16-ounce water bottles as 1-pound weights to start. The first time through the routines will give you a better idea of how much weight you can handle, but always remember you can up or downgrade during the exercises as needed. A Mat (or a Beach Towel) for floor work. A Hand towel for basic stretching. A Sturdy, High Back Chair with no arms and a stable base. so why are there no bikini pictures on our site? To us, transformation has nothing to do with how you look in a bathing suit. No before or after photo can show the life changing results you are about to experience from this plan! Our focus isn’t on achieving the perfect body (and let’s be honest, there isn’t one). We want to you to be strong, healthy and set a great example for your family. That’s why we don’t hire fitness models for our programs — you’ll only see real women in our kid-friendly videos and photos. Check out our real, unpaid testimonials here for more inspiration to start your own personal Walk STRONG journey. (Quotes featured on this page excerpted from actual Amazon reviews). Questions about the program? Check out our FAQ page for answers. Need additional assistance? Contact us here.